Work: Member of first Maryland Committee of Safety, Provincial Congress, 1775; Delayed member of Continental Congress, August, 1776, Signed Declaration of Independence; Appointed to board of War, 1776; Elected to Senate of Maryland, 1781; Elected U.S. Senator from Maryland, 1788, returned to Maryland Senate 1789-'99. 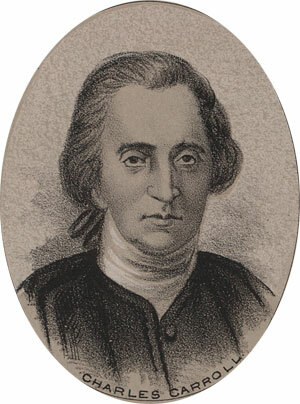 Carroll was an early advocate for armed resistance with the object of separation from Great Britain. However, his native colony was less certain in this matter and did not even send a representative to the first Continental Congress. He served on the first Committee of Safety, at Annapolis, in 1775, and also in the Provincial Congress. He visited the Continental Congress in 1776, and was enlisted in a diplomatic mission to Canada, along with Franklin and Chase. Shortly after his return, the Maryland Convention decided to join in support for the Revolution. Carroll was elected to represent Maryland on the 4th of July, and though he was too late to vote for the Declaration, he did sign it.